Board, as group work and service to our people and brothers, have a badge that identifies them as develop their preparatory work, organization and coordination of activities pertaining to it. In the IV General Assembly of the Guild of St. George, Celebrated on 19 February 2011, es va aprovar per unanimitat la Insígnia que identificaría la Junta Directiva a partir d’aquesta data. 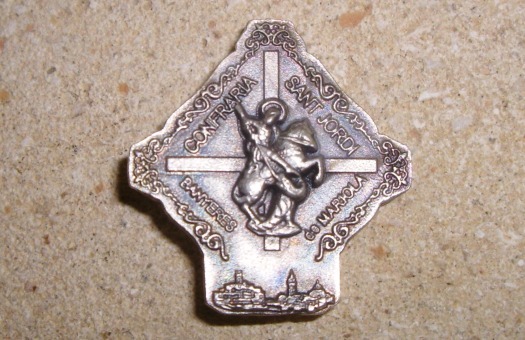 Fins l’any 2011, the various boards of the Brotherhood of St. George did not have a badge that identifies itself. Each had a different one each time. The Insignia was initially created by the board chaired by D. Jorge Enrique Romero Esteve for the period 2008-2011 incorporates elements that identify the essence and the raison d'être of the Brotherhood: in downtown St. George; at the bottom at the foot of St., a view of our village Mariola; in the background the cross of St. George, as a sign of his martyrdom and efforts and service that the Board does for the greater glory of St. George and our people. Around the whole legend "Brotherhood of St. George Mariola" that identifies; and set a border closing that enriches and decorative ornaments. this badge, as usual being sold to other, can only be used by members of the Board that are active members or by members of the above Boards, and only acts that were recognized as Board.